Fresh from showing glimpses of the next-generation Outlook Web Access client in a preview ofExchange Server 2016, Microsoft has now detailed just how the new version of the browser-bound Outlook will work. There's a new name for starters: “Outlook Web Access” is now “Outlook on the web”. Those marketers sure are earning their wage! One of the things you'll see on the toolbar, depicted below, is the “Sweep” command. 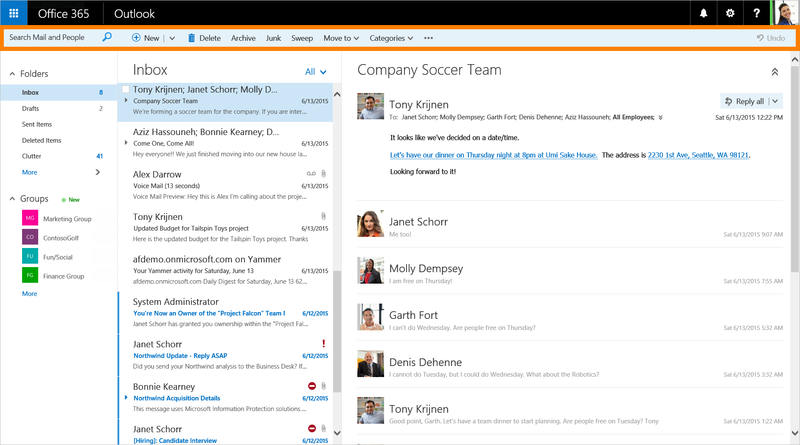 Outlook for the Web's new interface, featuring the orange-highlighted ' Action toolbar' Click here to embiggen. There's also an improved visual editor, complete with emoji support, said to make the chore of adding inline images to email easier. The single-line view has been enhanced to offer a preview of a mail's content, not just the subject line. Everything's been tidied up for mobile use, across mail and calendar, which gets a weather forecast and “charms”, wee icons you can add to events to that flights are adorned with little pictures of airplanes. So cute. And so productivity-enhancing, for sure.